The secret is using plain whole milk Greek yogurt, which is lower in carbs and higher in protein than regular plain yogurt. Mix together with our smoothie mix, cold water, heavy cream, vanilla and ice, and voila! 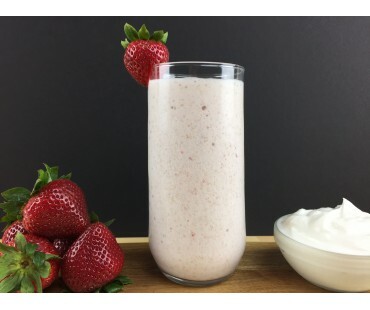 A thick, decadently creamy strawberry smoothie perfect for a mid-afternoon snack or an after dinner treat! Our low carb smoothie mix is made of chia, whey protein and our all natural zero carb sweetener, giving you a healthy dose of dietary fiber and protein in each scrumptious glass. Make it extra special by garnishing with a strawberry or some unsweetened coconut. And be sure to use one of those big, thick straws so you can enjoy every last delicious drop! I use it with goat milk kefir and it makes a great smoothie!